It's a Crisis - How Do We Protect Our Kids? Paul Robeson on colonialism and African American rights circa 1960. The US war project in eastern Ukraine (Donbass) continues. Here is a video about the village of Sakhanka where they have been repeatedly attacked by the US-backed regime in Kiev. Even the local school as been hit by shells and had to be closed. Recently the regime in Kiev banned the speaking of Russian in Ukraine. Imagine how that goes over with the millions of Russian speaking citizens across the country. Each of these moves by the corrupt cabal (I won't call it a government) in Kiev further adds fuel to the already out-of-control war near the Russian border. 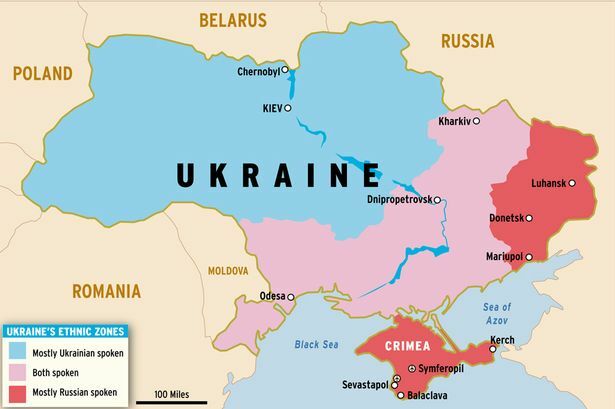 Kiev keeps sending heavy weapons and more troops to the eastern region of the country. US Army Special Forces continue to train and equip Ukrainian National Guard troops at a base in western Ukraine. Then these troops (many who originally were part of various Nazi death squad units) are deployed to the east to attack innocent civilians who live in villages like Sakhanka. All of this is intended to excuse US-NATO military expansion along the Russian border with hopes to actually draw Moscow directly into invading the Donbass region to protect the people. Instead Russia has provided arms to Ukrainian citizens living in the eastern region (coal miners, musicians, electricians, farmers, teachers, students, etc) so they can defend themselves. Russia has also regularly sent humanitarian aid to the Donbass as the people now suffer without jobs, food, medical supplies, electricity and more. My heart has been hurting all week for the people of our nation. This country has become so warlike and dysfunctional that the cancer sores are bursting loose. It's hard to watch. It makes many of us feel weak and consider giving up. A friend from Staten Island wrote me recently and asked, "How do we sustain and enhance our highest values at a time when lies, violence and cruelty seem to underlie most short and long-term policy decisions that impact our lives." This is the question of our times. We know who the monster is and what it wants. Mr. Big wishes to devour our Mother Earth and take down those who dare stand in his way. There are many theories about 'who and why' - but there is no real debate about the what.... We are in trouble as the greedy international oligarchies are rolling their dice and going for broke. They are the ones with the sign in their back car window that reads: Control the world or Bust! The corporate types don't give a damn about any one particular country anymore. They have no loyalty to any of us - when we hear Washington say they are "protecting our interests overseas" they are not talking about Mr. & Mrs. Average. They are talking about Wall Street - and the deep state. Little Johnnie, who innocently just signed up in the Army to go fight terrorism, actually joined up as a mercenarie for corporate interests - likely fossil fuel and weapons companies. One way we can overcome the feelings of defeat and fear in the midst of this American militarized culture is to allow our hearts to grow and reach out to others who have long lived under the US military boot. By being in solidarity with others we learn from them. The Native Americans know about living on the reservation - under lock down - culturally and physically. People in places like Okinawa have a long history of resisting US militarism and lessons to share. When we work together we create the unstoppable global momentum to remove the boot from our necks. While I [previously] joined in a sit-in with Okinawans and their supporters in Takae [forest area where US is building helipads for V-22 Osprey aircraft ignoring the will of the local people], I had an awaking moment of empowerment and commitment to the peace movement in Okinawa for the rest of my life. Right before the riot police removed us, I heard through a megaphone, "This is the police department. It has been two minutes since you occupied the gate. Please move immediately." One man replied, "Two minutes? What are you talking about? They have been occupying our land for 71 years! These years, we've endured. Only two minutes? Don't be a fool!" His words reminded me of how long they have resisted this injustice, and Okinawans’ commitment to continue fighting. A man who was sitting in front of me was wearing a blue shirt that stated: How to win.... Never give up until you win. This is the Okinawan spirit of Nuchi kajiri, an Okinawan word for "as long as we live." As long as I live, I will demand justice and peace, and stand in solidarity with Okinawans. There is an Okinawan phrase that "life is a treasure." As we reconnect with the good spirit in others we find our way through the darkness toward the light. I just returned from a national conference titled “War and Environment” held at American University in Washington DC. I was invited to speak on the subject of conversion of the military industrial complex to sustainable production in order to help us deal with our present challenge of climate change. While riding Amtrak to Washington I worked on my speech and was following the massive devastation of Puerto Rico and the US territory of Virgin Islands. Where will the money come from to help the 3.4 million people now dislocated in Puerto Rico? 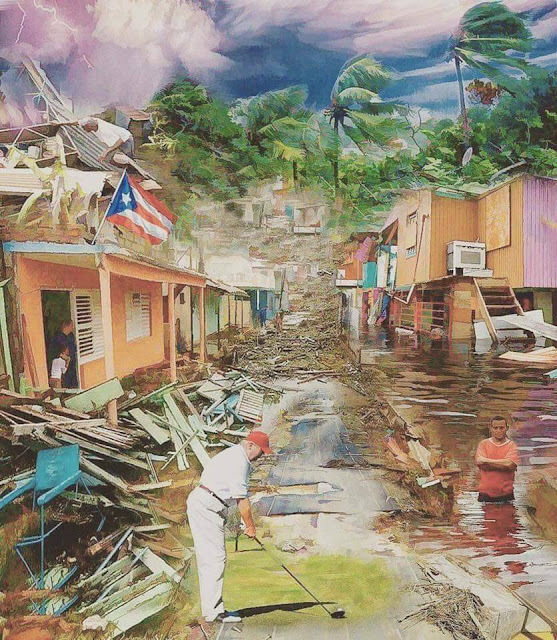 It seems to me that we should be discussing the need to turn our military into the ‘Natural Guard’ as warming oceans create larger and more deadly hurricanes with wind speeds that level trees and homes. Global warming is a national security crisis. During my talk at the conference I spoke about the urgent need to reorient our fossil fuel dependent economy and used as my example our long-time campaign in Bath to call for the conversion of Bath Iron Works (BIW). Imagine building commuter rail systems at BIW. My partner now takes the BREEZ bus from Brunswick to work in Portland. She rests, reads, and gazes out the window while someone else does the driving. As demand grows for this public transit option the BREEZ bus won’t be big enough. Commuter rail systems would be the next best step but where would they be built? Maybe Canada, France or Japan? Why not at BIW. Studies at UMASS-Amherst Economics Department have long shown that we’d get more jobs at places like BIW if we built rail, wind turbines, solar and tidal power systems. Isn’t everyone interested in more jobs? Conversion is not a new issue to me. 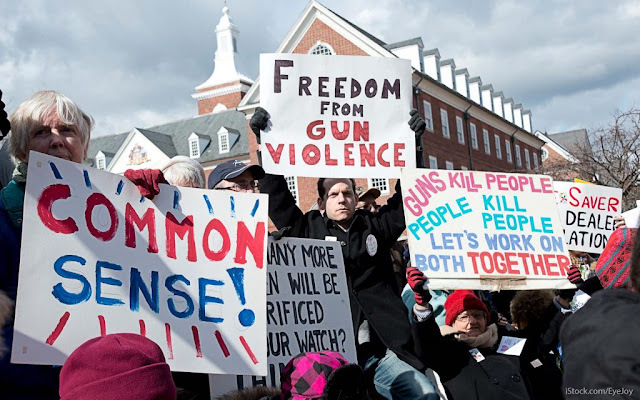 In the late 1980s and early 1990s while working for the peace movement in Florida I organized around this issue and built a statewide conference on the subject. The keynote speaker at that event was the President of the International Association of Machinists George Kourpias. Kourpias came to BIW on Labor Day in 1994 and joined a star-studded cast that included President Bill Clinton, Sen. George Mitchell, Rep. Tom Andrews, BIW President Buzz Fitzgerald and other national and local labor leaders. They all called for the conversion of the shipyard to civilian production so there is indeed a tradition in Bath along these lines to ensure job and community stability. As the planet heats up, the oceans warm and acidify, and Arctic ice melts we witness the release of methane that only accelerates the global warming problem. The Gulf of Maine is heating up and lobsters are heading north. Other troubling signs are revealing that we have a very short window to move toward a sustainable society before it is too late. All of us must make changes and we must start in our own communities. Our children are looking to us for leadership as Hurricanes Harvey, Irma and Maria become the new normal. Few had ever expected that the Naval Air Station in Brunswick would close but the transition has shown steady progress in converting the former base to alternative uses. But planning is essential. Our nation is currently $20 trillion in debt and the response in Washington has been to print more funny money. Our domestic economy is hanging together by a shoestring. At any moment we could go belly up and military production facilities like BIW could quickly be shuttered. 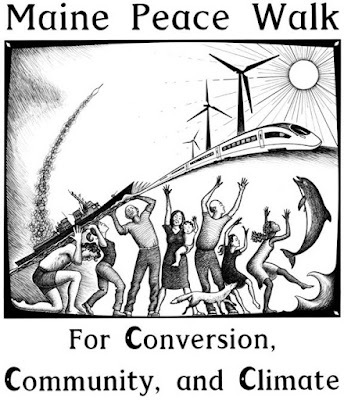 We have every legitimate reason to begin planning now for a successful conversion process that enables us to create jobs and to build products that help us deal with global warming. We must ensure that workers are supported during any such transition process but that takes public discussion, political will and advance planning. During the period of Oct. 13-21 a coalition of groups from Maine (including Veterans For Peace and PeaceWorks) will be undertaking the Maine Peace Walk for Conversion, Community and Climate. During those days volunteers will distribute flyers in Bath and Brunswick and other events will be held. Things will actually begin with the showing of a great new film called “Village versus Empire” on Oct. 12 at the Frontier Café at 7:30 p.m. The public is invited to attend our Oct. 17 Pot Luck supper and panel discussion at 6 p.m. in Brunswick at the Unitarian Church across from the library. The public is also invited to our Walk finale event (speakers & music) at the Bath Waterfront Park on Saturday, Oct 21 from noon to 2 p.m. Accepting our present condition of endless war to control fossil fuels is a dead-end street that if not reversed will lead to our collective demise. We must have a conversion that begins with our hearts and extends to the timely task of totally reorienting our national production system. 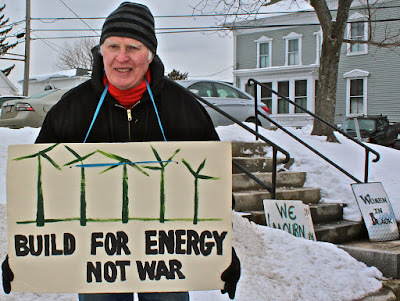 ~ Bruce K. Gagnon is a member of PeaceWorks and lives in Bath. Demonstrations at Cape Canaveral, Florida (more than 1,000 attended) and across the country occurred protesting the scheduled launch of the space probe Cassini because its power source was three plutonium-fueled Radioisotope Thermoelectric Generators. The probe carried 72.3 pounds of plutonium, the most ever put on a rocket (with a 10% failure rate) to be launched into space. The concern was for an accidental release in the event of a launch mishap. NASA's own Environmental Impact Statement (EIS) reported that in a worst case launch explosion and release of the deadly plutonium the winds would carry radioactive debris for a 60-mile radius. Every person, building, animal, plant & tree, and the top inch of soil would have to be removed as the area would be radioactive for thousands of years. NASA continues to plan for more nuclear-powered space missions in the years ahead. The nuclear industry views space as a new market for nuclear-powered mining colonies on the Moon, Mars and other planetary bodies. At a string of Department of Energy (DoE) labs across the nation the plutonium generators are produced. In 1997 a newspaper in Santa Fe, NM reported 244 cases of worker contamination as they were fabricating the Cassini plutonium devices at Los Alamos Labs. Plutonium is the most toxic substance known. "It is so toxic," says Helen Caldicott, president emeritus of Physicians for Social Responsibility, "that less than one-millionth of a gram is a carcinogenic dose. One pound, if uniformly distributed, could hypothetically induce lung cancer in every person on Earth." • Philadelphia, Pennsylvania (Oct 7) Silent vigil in Center City representing the deaths of those killed by drones. 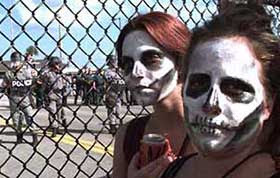 As street theater, we remain silent, wearing masks and black clothing. 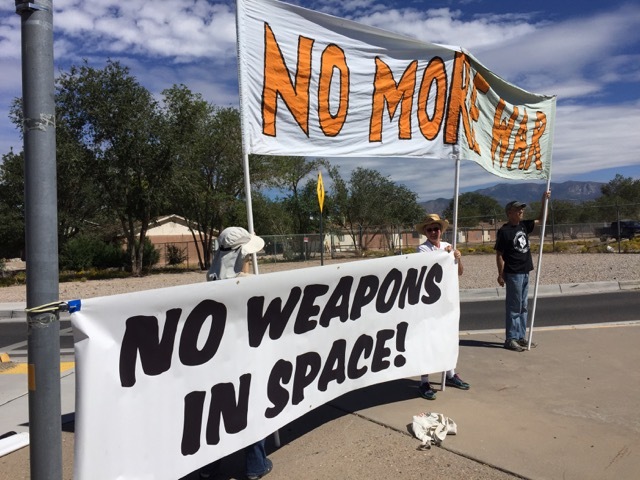 Please come out for one hour to let people on the street know we do not support ENDLESS WARS, using U.S. DRONES, other powerful weapons and U.S. military on the ground and in space. Meeting at 12th & Arch Street from 11:45 am to 12:45. Call Marge Van Cleef at 203-804-3013. 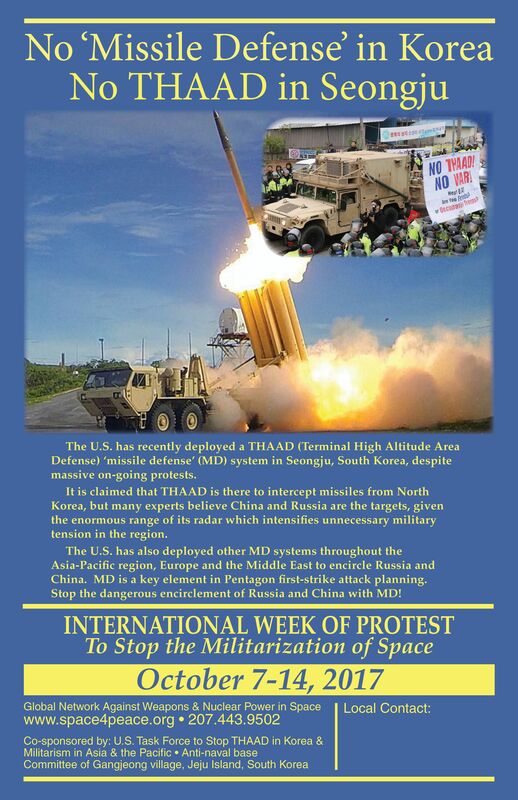 • Seongju, South Korea (Oct 7-14) Nightly candlelight vigil against US deployment of THAAD missile defense system near their community (a parking lot across from the Seongju County Office) The Seongju nightly candle vigil hit its one year anniversary as of July 13, 2017. • Soseong-ri, Seongju, South Korea (Oct 7-14) Soseong-ri in Seongju is located just next to Gimcheon. It is a small village lived by around 160 people - mostly elderly women and men farming melons. The residents and their supporters have been protesting day and night since the former Lotte Skyhill Country Club site in Soseong-ri was discussed as the planned THAAD deployment site in August, last year. A radar and two launchers of THAAD system were forcefully deployed in the former LCC on April 26, this year. And deployment of additional four THAAD launchers were enforced on Sept 7. On the day, 500 people resisted for 18 hours. Even after the completion of THAAD deployment, people in Soseong-ri are continuing their daily protest demanding the removal of THAAD. They also hold a regular rally every Wednesday in front of Soseong-ri village hall, which started on Nov 30, 2016. Recently a man named Cho Young-sam immolated himself against THAAD in Seoul on Sept. 19. On the day of his funeral on Sept. 23, a procession in memory of his will against THAAD was extended to Soseong-ri, too. 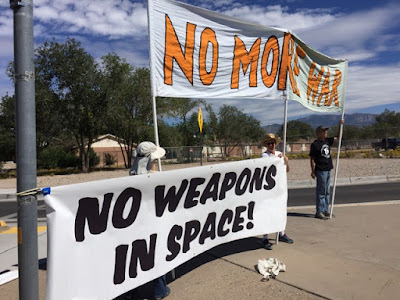 • Vandenberg AFB, California (Oct 4) Keep Space for Peace vigil at space warfare base at the Main Gate from 3:45 pm to 4:45 pm. For information contact Dennis Apel at 805-343-6322. Wounded Knee was the largest mass shooting in U.S. history that left around 300 innocent men, women and children dead. 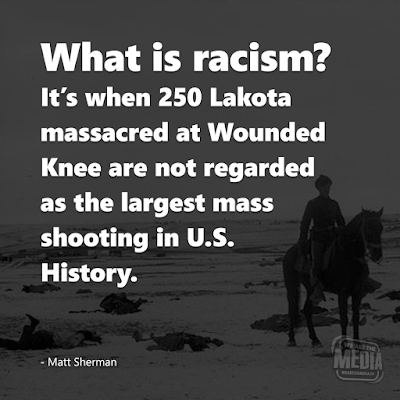 Don't forget about the Lakota victims of December 29, 1890. The terrible news from Las Vegas, Nevada this morning about the domestic terrorist who gunned down hundreds of people at a concert was staggering to anyone with a conscience. As I write this the reports are that at least 58 have died and up to 500 were injured as one man, armed with as many as 23 weapons, stood at the window in a hotel and shot the people on the ground. These kinds of events just keep happening and the politicians keeping saying that we must pray for the victims and that we all must stand together and that the national flag will be lowered to half-mast. But nothing is ever done to deal with the tragic reality that it is just too damn easy for anyone to buy military-style weapons on the open market. But the bigger issue is that the very core of America's soul is violent - the fabric of our nation was woven together with strands of violence. The slaughter of the Native Americans; the brutality of slavery and the Civil War that resulted from that evil economic institution; America's long empire building military rampage to steal land from Mexico and to expand into the Pacific; endless wars and our current carnage in Syria and Yemen today; Trump's 'fire and fury' threats against North Korea. Let's be perfectly honest about this situation - the US on a weekly basis kills and wounds hundreds of people around the world with its 'full spectrum dominance' as the Pentagon has been turned into the military arm of corporate globalization. At public schools across this nation kids are trained to shot rifles in Junior-ROTC classes getting them into the 'right frame of mind' to enlist and head off to the Middle East or Africa to kill other (mostly) innocent human beings on behalf of a corporate agenda to steal land and natural resources. So praying for the victims and their families (yes please do) will not end this madness that is buried deep inside our hearts and minds. We've become a killer nation. We worship violence and the weapons systems that carry our violent spirit around the world. Our nation will continue to see these kinds of domestic terror events until we look deeply into the mirror - each of us - and repeat these words, "My name is America and I am addicted to violence, weapons production, and endless war." Our collective American soul has demons locked inside and we need a national 12-step program to help us remove this violent curse. The politicians will never lead us to a proper healing - it can only come from the people themselves and it seems most Americans are not yet ready to admit our addiction or the need for our healing. Until that day comes the prayers won't be enough. 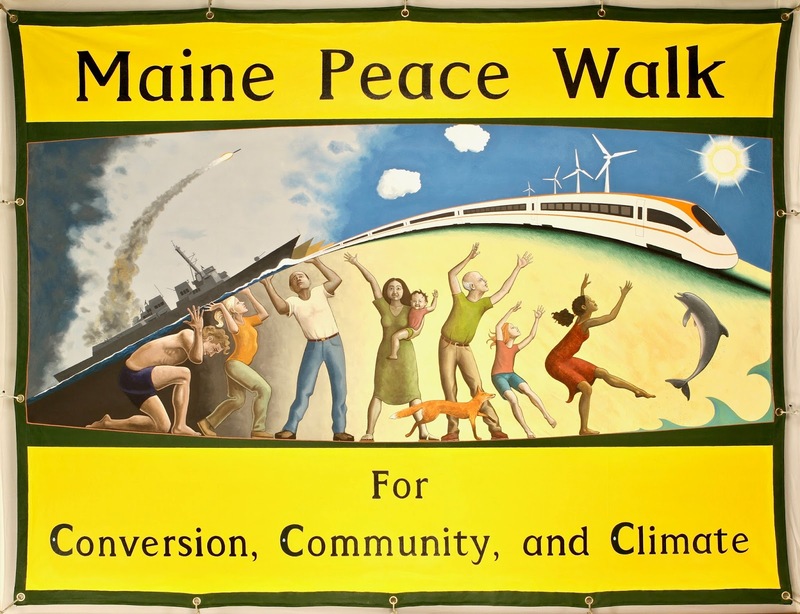 The 6th annual Maine Peace Walk will come to Brunswick on October 17. Please join us in greeting the walkers with a public supper and hear these excellent speakers. Joyakgol – South Korean peace activist from Jeju Island who has been working for the past 20 years to stop US base expansion in his country. He also works to protect the endangered Indo-Pacific Bottlenose Dolphins who daily circle Jeju Island and are now threatened by the new Navy base. Destroyers built at BIW have begun to port at the new base. Heidi Garrett-Peltier holds a Ph.D. in Economics from the University of Massachusetts, Amherst and works as an assistant research professor for Political Economy Research Institute (PERI). Her research focuses on the employment impacts of public and private investments, particularly in the realm of clean-energy programs. Heidi has written and contributed to a number of reports on the clean energy economy. She has also written about the employment effects of defense spending with co-author Robert Pollin, consulted with the U.S. Department of Energy on federal energy programs and is an active member of the Center for Popular Economics.